Perris, California.........(October 2, 2018) Perris Auto Speedway promoter Don Kazarian has announced an increased purse for the west coast's premier sprint car race, the 23rd Annual Budweiser Oval Nationals Presented by All Coast Construction featuring both the USAC AMSOIL National and CRA Sprint Car Series. The race will take place on November 8th, 9th and 10th at the famous Riverside County half-mile clay oval. While first place prize money for the Saturday A-Main will remain at $25,000, second place has increased from $10,000 to $15,000 and third place has increased from $5,000 to $10,000. In addition, the money to start the race has increased from $500 to $1,000. The Thursday and Friday A-Mains will pay $5,000 to win and $500 to start. The total purse for the three-day show is a whopping $131,380! 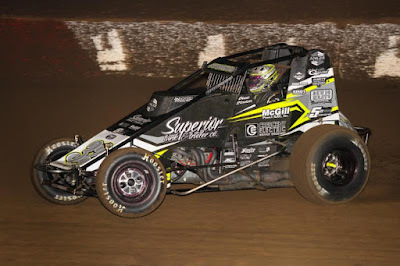 "I want to thank Mike Grosswendt from All Coast Construction for supporting the Oval Nationals and for everything he does for sprint car racing," Kazarian said. "He jumps in with both feet to make this all possible. He loves sprint car racing and he is totally dedicated to making it a better sport." Entry blanks for the Oval Nationals are available at http://perrisautospeedway.com/. Advance tickets are available at the following link https://pas.tix.com/Schedule.aspx?OrgNum=7. For fans who do not wish to buy advance tickets, there will be plenty available for everyone at the front gate each night. For further information, contact Scott Daloisio (909) 226-7768 or or mail to: perrisautospeedway1@gmail.com.